People with diabetes are better at estimating their blood glucose in natural, everyday situations, as opposed to clinical laboratory settings (Cox et al., 1985). In some ways this is surprising as natural hypoglycaemia often occurs at a time when it is unexpected. In this situation, attention toward symptoms will not be as actively directed toward detection as in the laboratory setting where it is usually anticipated. Furthermore, hypoglycaemia in everyday life occurs on the background of other bodily feelings and must be separated from other causes of the same symptoms. For example, exercise and various acute illnesses can provoke sweating in people with diabetes, independently of their association with hypoglycaemia. without the correct interpretation of the cause of the symptoms is equally dangerous. Furthermore, it is obvious that someone who does interpret symptoms correctly as being caused by hypoglycaemia, but who does not take action to treat the low blood glucose, will be at the same risk. 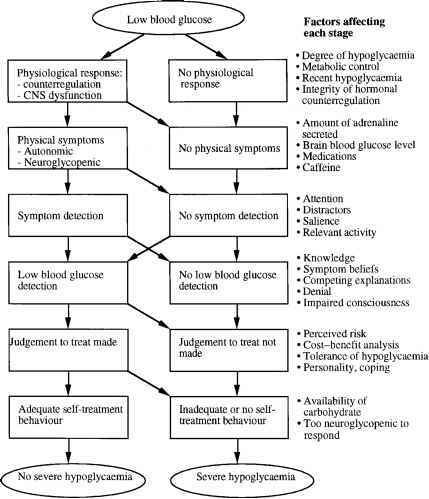 These and other steps toward the avoidance of severe hypoglycaemia demonstrate the key role of education about symptoms in people with diabetes (Gonder-Frederick et al., 1997). The psycho-educational programmes of Blood Glucose Awareness Training (BGAT; Schachinger et al., 2005) and Hypoglycemia Anticipation, Awareness and Treatment Training (HAATT; Cox et al., 2004) have led to better recognition of hypoglycaemic states and reduced frequency of hypoglycaemia. Figure 2.2 outlines the stages that intervene between low blood glucose occurring in an individual and the implementation of effective treatment (Gonder-Frederick et al., 1997). It is interesting to note the importance of behavioural factors in generating states of low blood glucose. Episodes of low blood glucose are most likely to come about because of changes in routine aspects of diabetes management, such as taking extra insulin, eating less food or taking more exercise (Clarke et al., 1997). These factors predict more than 85% of episodes of hypoglycaemia in people with diabetes. In the presence of an intact physiological response to low blood glucose, autonomic and neuroglycopenic symptoms, and symptoms of general malaise, are generated (Figure 2.2). The degree of hypoglycaemia, the person's quality of glycaemic control and any recent episodes of hypoglycaemia may all affect the magnitude of the body's physiological response. Recent, preceding hypoglycaemia can reduce the symptomatic and counterregulatory hormonal responses to subsequent hypoglycaemia, resulting in a diminished awareness of symptoms. This effect of 'antecedent' hypoglycaemia is described in Chapter 7. Gender does not appear to influence the symptomatic response to hypoglycaemia (Geddes et al., 2006). At the second stage in Figure 2.2 comes the actual generation of physical symptoms. Among the variables that can influence this stage is the prior ingestion of caffeine, which has been shown to enhance the intensity of the autonomic and neuroglycopenic symptoms of experimentally induced hypoglycaemia (Debrah et al., 1996) (see Chapter 5). Caffeine may act by increasing the intensity of symptoms of hypoglycaemia to perceptible levels, much as a magnifying glass enables one to read otherwise too-small print. people who had higher anxiety levels were better at detecting symptoms of hypoglycaemia (Ryan et al., 2002). 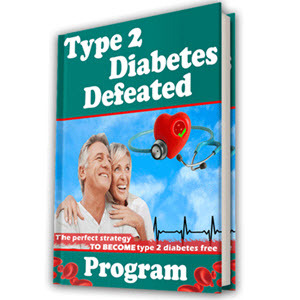 • people with insulin-treated diabetes cite autonomic and neuroglycopenic symptoms with equal frequency as the primary warning symptoms ofhypoglycaemia (Hepburn etal., 1991). The correct detection of a symptom of hypoglycaemia does not always lead to correct interpretation (Figure 2.2). After correctly detecting relevant symptoms, people fail to detect about 26% of episodes of low blood glucose (Gonder-Frederick et al., 1997). There are several factors that could break a perfect relationship between detection and recognition, and some are discussed below. However, it should be appreciated that symptom detection (internal cues) is not mandatory for the detection of low blood glucose. Self-testing of blood glucose or the information of family members (external cues) can lead to the successful recognition of hypoglycaemia without the patient having detected the episode by symptomatic perception (see Box 2.1). In the midst of this ignorance, much hypoglycaemia may not be treated because of a lack of knowledge of the symptoms of hypoglycaemia which would aid their recognition. Most, if not all, of the symptoms of hypoglycaemia can be explained by other physical conditions. Therefore, correct symptom detection may be usurped by incorrect attribution of the cause. For example, having completed some strenuous activity, an athlete may attribute the symptoms of sweating and palpitations to physical exertion. An obvious problem in detecting a low blood glucose is the fact that the organ responsible for the detection and interpretation of symptoms - the brain, especially the cerebral cortex - is impaired. 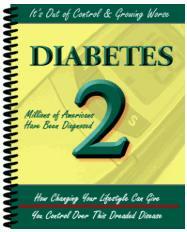 Thus, impaired concentration and lowered consciousness levels can beget even more severe hypoglycaemia. The controversy about the effect of human insulin on symptom awareness (Chapter 7) stimulated the development of scoring systems for hypoglycaemia to allow comparative studies between insulin species. This produced scoring systems such as the Edinburgh Hypoglycaemia Scale (Deary et al., 1993), and any such system must be validated for research application. It is important to note that the nature and intensity of individual symptoms are as important as, if not more important than, the number of symptoms generated by hypoglycaemia. The concepts involved are discussed in detail by Hepburn (1993). More information on the symptoms of hypoglycaemia is provided by McAulay et al. (2001b).